When it is so hot out, there are really only two options for dinner: break out the grill, or opt for a cool salad. Who says you can’t do both? This delicious salad combines the meaty, flame-grilled goodness of a barbequed steak and the lightness of a cool veggie salad. It is simple, but elegant and is a perfect meal for a hot day. What more can you ask for? *To save time, consider using a jar of minced garlic, which can be found at your local grocer. Begin by seasoning the steak lightly with salt and pepper. Mix the oil and garlic together. Rub the steak all over with the garlic and place in large ziploc bag. Marinate for 2 hrs. Cook the steak, through your method of choice, to medium rare. Remove from heat and let stand for 5 to 10 mins to reabsorb juices. Slice thinly against the grain and set aside. Meanwhile, divide the arugula between the plates. 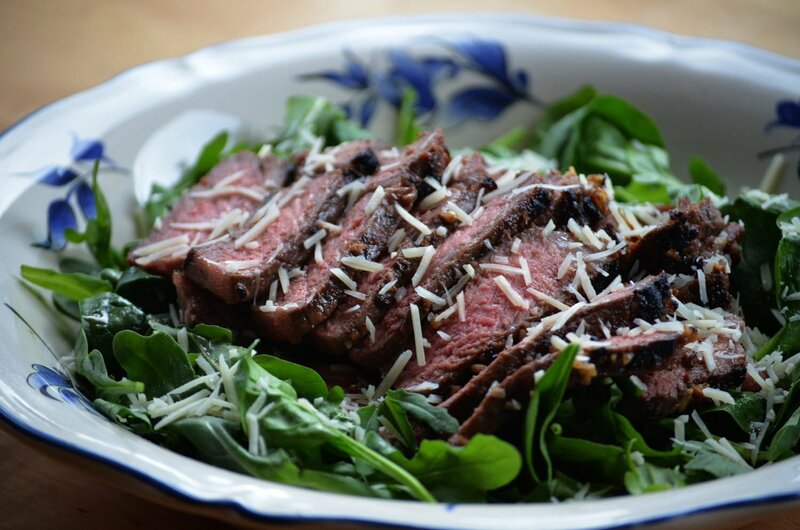 Place half of the steak on the bed of arugula on each plate. Top with the aged parmesan and pepper to taste.